Enjoy hassle-free rental experiences. Advertise for FREE on our site, save on long distance charges, rent your cottage to vacationers that meet your requirements and get paid in advance. Cottage Connections does it all for you. There are no fees for cottage owners to use our services! We have many renters looking for cottages and our market is primarily from the U.S.A. and Canada, although we do get inquiries from Europe as well. 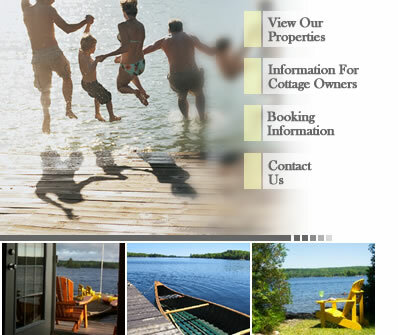 We accept listings for summer waterfront cottages in Ontario. Additionally, we take the photos, handle the inquiries and take the hassle out of renting. There is no set up or registration fee. Hassle free renting-we handle the paperwork and save you time, money and risk! As a cottage owner, you must compile a list of instructions and information about your cottage to leave for renters and check the cottage between tenants. Want to list your cottage? We would love to help you rent your property. We only list privately owned, waterfront properties with good swimming. We attempt to take the hassle out of rental for the owner, handling all inquiries, collection of payments and security deposit. You are paid in advance by Cottage Connections and your obligation is to check the property (or have someone else do it for you) on Saturdays between 11am and 3pm. We have a No Party Policy and many of our clients are repeat tenants. Additionally, we accept Visa or Mastercard for security deposit in addition to the signing of a thorough contract. Renters provide their own bed sheets and towels for your convenience. Upon booking a renter is required to submit a 30% deposit. The balance is payable one month prior to arrival. The cancellation policy is strict and we rarely have cancellations. Properties rent from Saturday at 3pm to the following Saturday at 11 a.m.
To proceed, please send us an e-mail with your property's location and some details including accurate description of the waterfront (if you do not have good swimming, we cannot rent your property), number of bedrooms and some photographs. Photos can also be sent via regular mail if that is easier for you.